Hong Kong, or HK, odds are relatively easy to follow and express. These odds are simply yet another expression of the relationship between your initial stake and your potential profit. Different locations express odds in different formats and it is always helpful to know the local “language” when it comes to gambling. Sports betting in Hong Kong is very sophisticated and developed. There are many large syndicates that place huge wagers on everything from soccer to horse racing, all trying to grind out any edge they can find and exploit the book. An edge of 1 or 1.5% may not seem like much, but when you’re betting $250,000 and more per game, this can add up fast. There are many “runners” employed in Hong Kong to simply place bets for others in exchange for a cut of the profits, or for a flat payout no matter if the bet wins or loses. If you’re looking for action, Hong Kong will certainly satisfy your cravings. There are traditional bookies in Hong Kong, both online and underground, as well as the betting exchanges that have become popular online. Depending on how much action is needed, a combination of all 3 types of bookies may be used. Again, large syndicate action is common in Hong Kong. These groups use computer programs to figure out where they have an edge and try to get down as much action as possible, wherever they can bet big. It is an interesting topic and one that is covered in articles and books throughout Hong Kong. Here are a few examples of Hong Kong odds in everyday use. You will notice a lot of similarities between HK odds and other odds such as Malay odds. Many believe HK odds are the simplest and easiest to understand odds in the world. This means that for each $200 you bet, you will win $80. If you lose, of course the entire $200 goes to the bookie. This bet is “even money” or 1/1. If the game goes over the 2.5 goals, you win the exact amount you wagered. If it stays under, you lose your stake. In this case, you bet $200 and won $200. These odds are more of a long shot and represent a futures bet where Mexico is picked to come out of their group stage and advance by winning the group. As you can see, the odds are over 4/1 for this bet. These odds are very simple, and only show how much you will win for each unit wagered. HK Odds may be the simplest of all formats to understand. If the odds are a decimal lower than 1, the team is a favorite, and you will win back less than 1 unit for each unit wagered. For odds of exactly 1, you are looking at an even money bet that pays out 1/1. And for any odds above 1, you will get paid more than one unit for every one wagered if your selection happens to win. Be sure to check our odds converter tool that can be used to convert easily to and from HK, Malay, American, and UK odds. This will pretty much do all the math and work for you, and will give you an easy way to express odds in different formats. 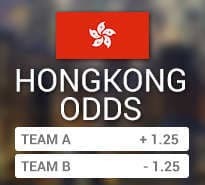 HK odds are very similar to UK odds, except instead of using fractions, HK odds use decimals. This makes it a bit easier to figure the math out on the fly.